This invigorating spray will easily deliver a boost of antioxidants, collagen amino acids, and energizing Vitamin C to hydrate and revitalize tired, stressed out skin. Is used in conjunction with our Star Light Peel Off Mask, but it can used alone as a facial spray that replaces your greasy moisturizers. Spray this on your face when your skin feels tired, dried out, and dull from staring at your computer all day, or sitting on a long flight. This specially-formulated moisturizing spray is up to 400% stronger than the leading competition with 20% Vitamin C compared to the usual 10%, 1% Vitamin E instead of 0.2%, and 10% Hyaluronic Acid 2x more than other moisturizing sprays which contain only 5%. Plus, Witch Hazel to nourish dry skin, and reduce that puffy eye look caused by stress and sun exposure. By spraying this relaxing mist on your face to set makeup you are giving your skin a revitalized, refreshing glow, that beams a multifaceted healthy radiance making you look and feel completely refreshed and ready to take on the day. Your skin deserves to be re-energized and should be pampered with a vitamin and antioxidant rich multitasking mist that works to set and refresh makeup, hydrate skin, and provide a pollution shield to protect against environmental aggressors. 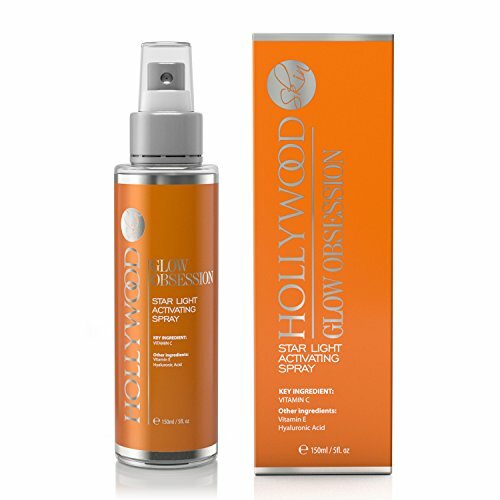 Star Light Spray can easily fit in your handbag ready to use when your skin is feeling tight and tired and needs some nourishment with the powerful combination of energizing Vitamin C and Hyaluronic Acid to hydrate the skin without disrupting your makeup. This potent combination of natural antioxidants and collagen amino acids to quickly hydrate the skin leaving it refreshed and energized when it's feeling dull and tired. This moisturizing spray can be used in conjunction with Star Light Peel Off Mask to activate the powerful ingredients giving the skin a bonus mixture of refreshing hydration and anti-aging benefits. It can also be used as a stand-alone product. HYDRATING ACTIVATING SPRAY: Powered by Vitamin C, E, Hyaluronic Acid, and rich in antioxidants. Your skin beams with a multifaceted radiance, looking and feeling completely fresh, and perfectly healthy. UP TO 400% STRONGER THAN THE LEADING COMPETITORS: With 20% Vitamin C compared to the usual 10% in other sprays, 1% Vitamin E instead of 0.2%, and 10% Hyaluronic Acid when others only contain 5%. Plus Witch hazel to minimize damage from sun exposure and fight signs of aging. CAN BE USED UNDER OR OVER MAKEUP: As a refreshing spray when skin feels dull and tired from sitting in front of a computer all day or long flights when skin easily gets dry and dull. This facial spray is great to bring in your handbag to quickly refresh your skin during the day. THE MOST POWERFUL HYDRATING FACIAL SPRAY ON THE MARKET: Packed with the highest concentrations of active ingredients. It's specially formulated to quickly hydrate skin and provide protection against environmental aggressors that stress and age the skin. YOU WILL LOOK AND FEEL YOUNG AT ANY AGE: With Hyaluronic Acid and Vitamins C, E + Collagen to hydrate skin and fill in fine lines and wrinkles giving you that brilliant radiance with a refreshing spritz that won't disrupt your makeup. If you have any questions about this product by hollywoodskin, contact us by completing and submitting the form below. If you are looking for a specif part number, please include it with your message. NuFACE Optimizing Mist | Anti-Aging + Hydrating with Aloe Vera, Hyaluronic Acid and Botanical Extracts | 1 fl. oz.